Discuss the method of heat transfer by convection. 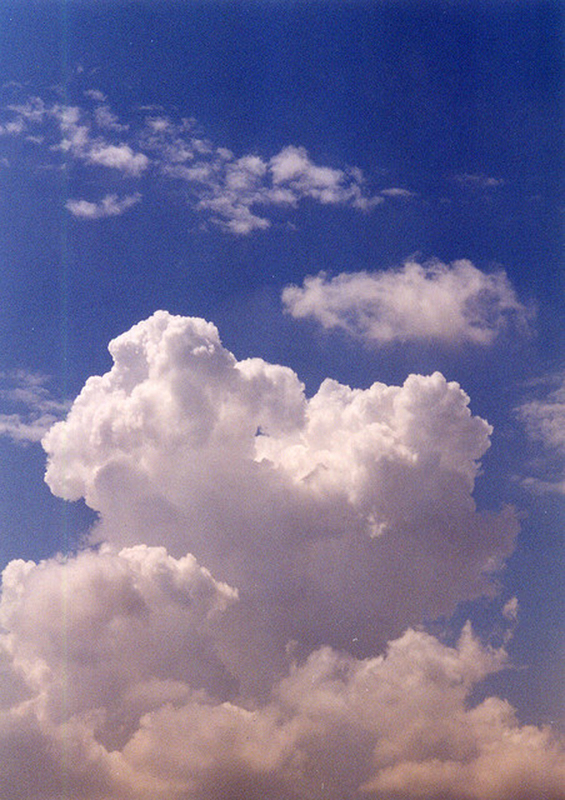 Convection is driven by large-scale flow of matter. In the case of Earth, the atmospheric circulation is caused by the flow of hot air from the tropics to the poles, and the flow of cold air from the poles toward the tropics. (Note that Earth’s rotation causes the observed easterly flow of air in the northern hemisphere). Car engines are kept cool by the flow of water in the cooling system, with the water pump maintaining a flow of cool water to the pistons. The circulatory system is used the body: when the body overheats, the blood vessels in the skin expand (dilate), which increases the blood flow to the skin where it can be cooled by sweating. These vessels become smaller when it is cold outside and larger when it is hot (so more fluid flows, and more energy is transferred). The body also loses a significant fraction of its heat through the breathing process. While convection is usually more complicated than conduction, we can describe convection and do some straightforward, realistic calculations of its effects. Natural convection is driven by buoyant forces: hot air rises because density decreases as temperature increases. The house in Figure 1 is kept warm in this manner, as is the pot of water on the stove in Figure 2. Ocean currents and large-scale atmospheric circulation transfer energy from one part of the globe to another. Both are examples of natural convection. Figure 1. Air heated by the so-called gravity furnace expands and rises, forming a convective loop that transfers energy to other parts of the room. As the air is cooled at the ceiling and outside walls, it contracts, eventually becoming denser than room air and sinking to the floor. A properly designed heating system using natural convection, like this one, can be quite efficient in uniformly heating a home. Figure 2. Convection plays an important role in heat transfer inside this pot of water. 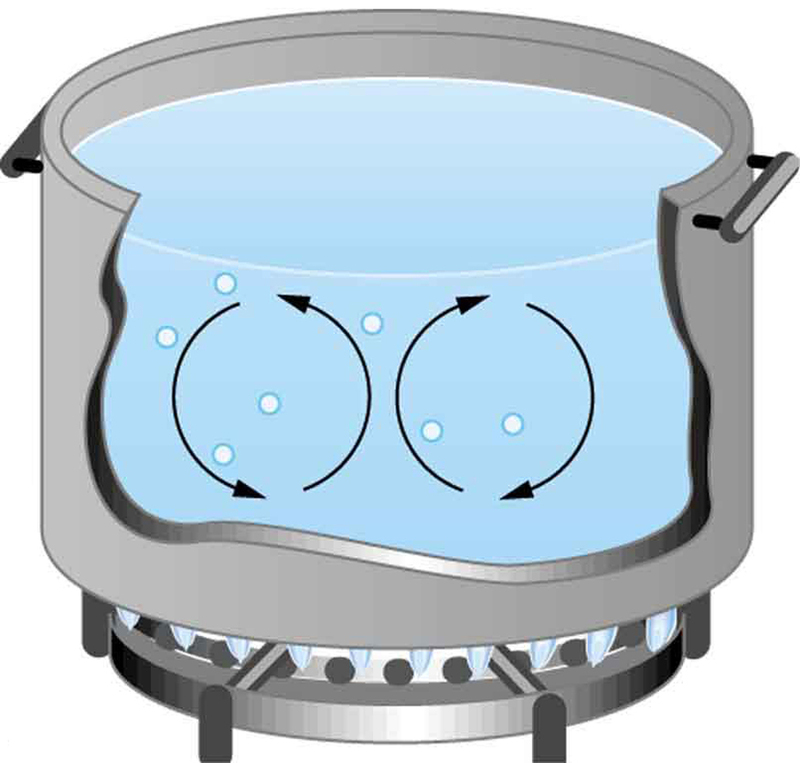 Once conducted to the inside, heat transfer to other parts of the pot is mostly by convection. The hotter water expands, decreases in density, and rises to transfer heat to other regions of the water, while colder water sinks to the bottom. This process keeps repeating. Take two small pots of water and use an eye dropper to place a drop of food coloring near the bottom of each. Leave one on a bench top and heat the other over a stovetop. Watch how the color spreads and how long it takes the color to reach the top. Watch how convective loops form. Most houses are not airtight: air goes in and out around doors and windows, through cracks and crevices, following wiring to switches and outlets, and so on. The air in a typical house is completely replaced in less than an hour. Suppose that a moderately-sized house has inside dimensions high, and that all air is replaced in 30.0 min. Calculate the heat transfer per unit time in watts needed to warm the incoming cold air by thus replacing the heat transferred by convection alone. 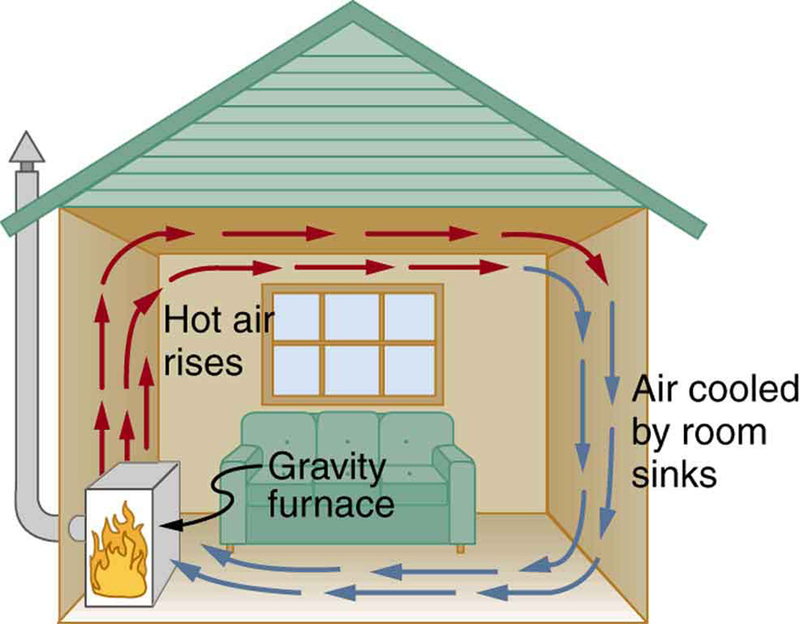 Heat is used to raise the temperature of air so that The rate of heat transfer is then where tt is the time for air turnover. We are given that is but we must still find values for the mass of air and its specific heat before we can calculate The specific heat of air is a weighted average of the specific heats of nitrogen and oxygen, which gives from Table 4 (note that the specific heat at constant pressure must be used for this process). Although air can transfer heat rapidly by convection, it is a poor conductor and thus a good insulator. The amount of available space for airflow determines whether air acts as an insulator or conductor. The space between the inside and outside walls of a house, for example, is about 9 cm (3.5 in) —large enough for convection to work effectively. The addition of wall insulation prevents airflow, so heat loss (or gain) is decreased. Similarly, the gap between the two panes of a double-paned window is about 1 cm, which prevents convection and takes advantage of air’s low conductivity to prevent greater loss. Fur, fiber, and fiberglass also take advantage of the low conductivity of air by trapping it in spaces too small to support convection, as shown in the figure. Fur and feathers are lightweight and thus ideal for the protection of animals. Figure 3. 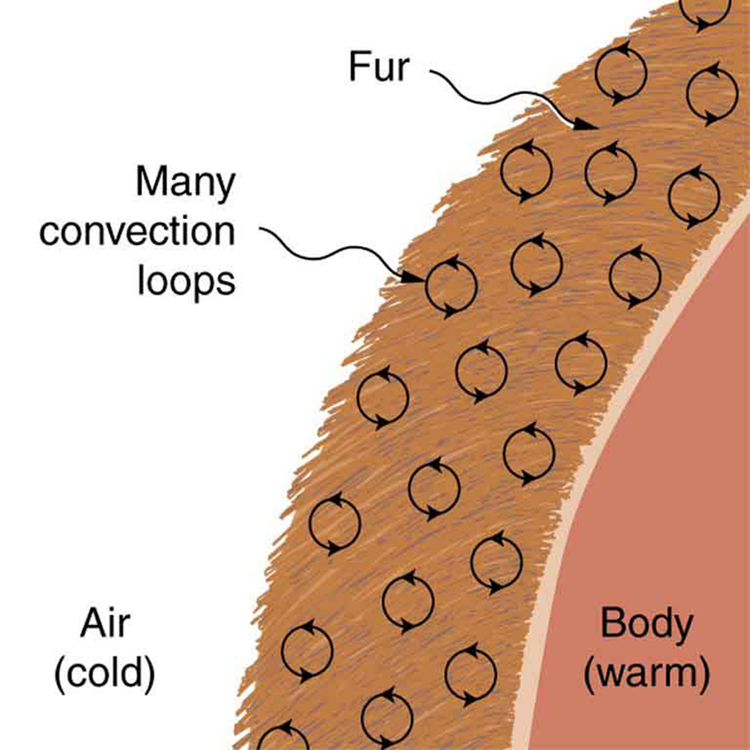 Fur is filled with air, breaking it up into many small pockets. Convection is very slow here, because the loops are so small. The low conductivity of air makes fur a very good lightweight insulator. Some interesting phenomena happen when convection is accompanied by a phase change. It allows us to cool off by sweating, even if the temperature of the surrounding air exceeds body temperature. Heat from the skin is required for sweat to evaporate from the skin, but without air flow, the air becomes saturated and evaporation stops. Air flow caused by convection replaces the saturated air by dry air and evaporation continues. Evaporating about 3 g/min seems reasonable. This would be about 180 g (about 7 oz) per hour. If the air is very dry, the sweat may evaporate without even being noticed. A significant amount of evaporation also takes place in the lungs and breathing passages. Another important example of the combination of phase change and convection occurs when water evaporates from the oceans. Heat is removed from the ocean when water evaporates. If the water vapor condenses in liquid droplets as clouds form, heat is released in the atmosphere. Thus, there is an overall transfer of heat from the ocean to the atmosphere. This process is the driving power behind thunderheads, those great cumulus clouds that rise as much as 20.0 km into the stratosphere. Water vapor carried in by convection condenses, releasing tremendous amounts of energy. This energy causes the air to expand and rise, where it is colder. More condensation occurs in these colder regions, which in turn drives the cloud even higher. Such a mechanism is called positive feedback, since the process reinforces and accelerates itself. 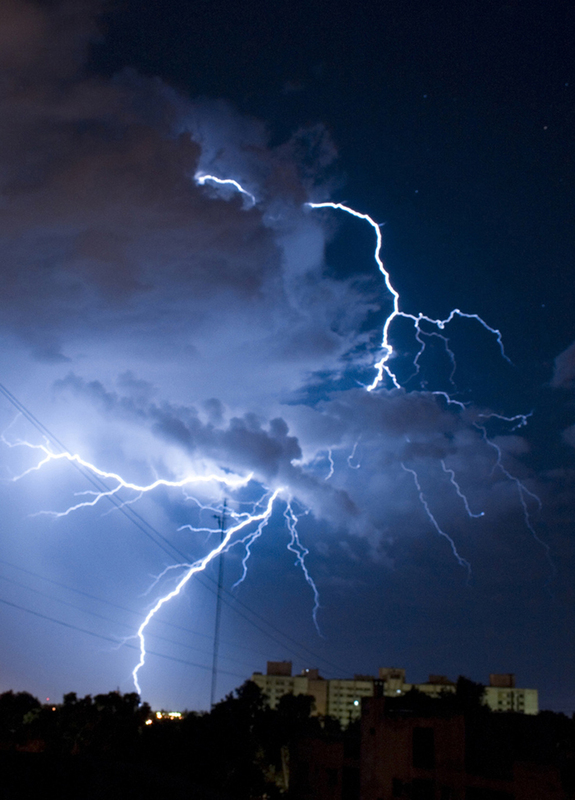 These systems sometimes produce violent storms, with lightning and hail, and constitute the mechanism driving hurricanes. 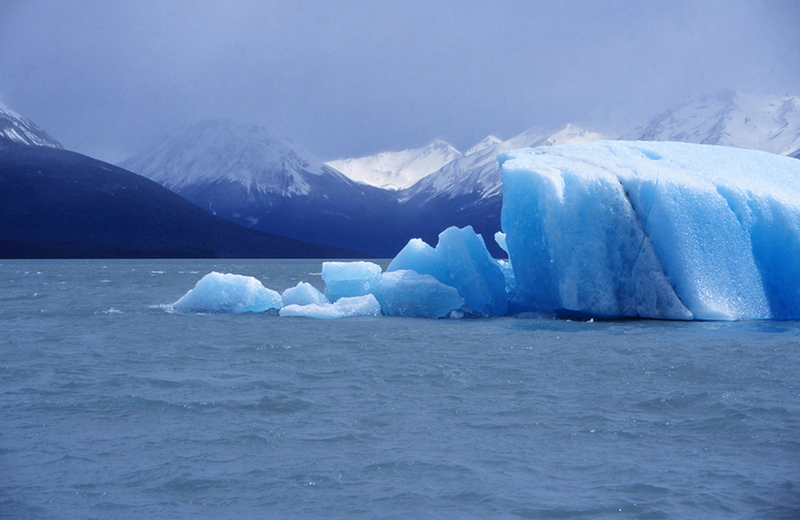 The movement of icebergs is another example of convection accompanied by a phase change. Suppose an iceberg drifts from Greenland into warmer Atlantic waters. Heat is removed from the warm ocean water when the ice melts and heat is released to the land mass when the iceberg forms on Greenland. 1: Explain why using a fan in the summer feels refreshing! Convection is heat transfer by the macroscopic movement of mass. Convection can be natural or forced and generally transfers thermal energy faster than conduction. Table 4 gives wind-chill factors, indicating that moving air has the same chilling effect of much colder stationary air. Convection that occurs along with a phase change can transfer energy from cold regions to warm ones. 1: One way to make a fireplace more energy efficient is to have an external air supply for the combustion of its fuel. Another is to have room air circulate around the outside of the fire box and back into the room. Detail the methods of heat transfer involved in each. 2: On cold, clear nights horses will sleep under the cover of large trees. How does this help them keep warm? 2: At what temperature does still air cause the same chill factor as air moving at 15 m/s? 3: The “steam” above a freshly made cup of instant coffee is really water vapor droplets condensing after evaporating from the hot coffee. What is the final temperature of 250 g of hot coffee initially at if 2.00 g evaporates from it? The coffee is in a Styrofoam cup, so other methods of heat transfer can be neglected. (b) Is this a reasonable amount of water to evaporate in the form of perspiration, assuming the relative humidity of the surrounding air is low? 5: On a hot dry day, evaporation from a lake has just enough heat transfer to balance the of incoming heat from the Sun. What mass of water evaporates in 1.00 h from each square meter? Explicitly show how you follow the steps in the Chapter 14.3 Problem-Solving Strategies for the Effects of Heat Transfer. 6: One winter day, the climate control system of a large university classroom building malfunctions. As a result, of excess cold air is brought in each minute. At what rate in kilowatts must heat transfer occur to warm this air by (that is, to bring the air to room temperature)? 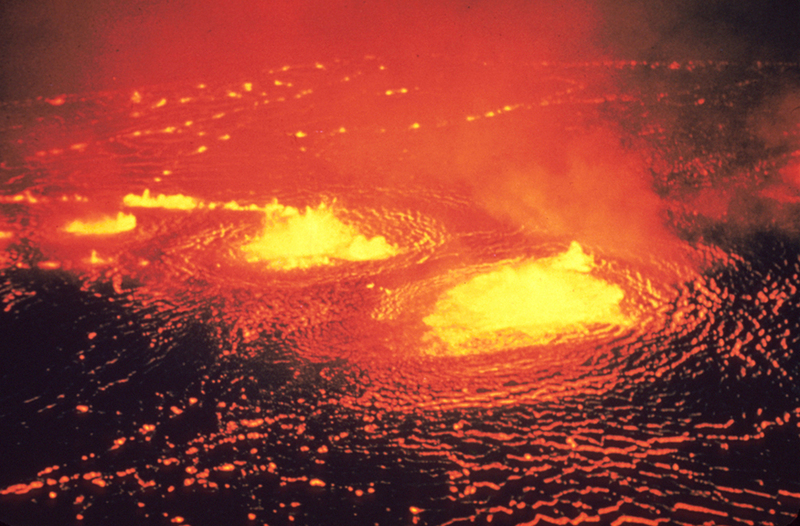 7: The Kilauea volcano in Hawaii is the world’s most active, disgorging about of lava per day. What is the rate of heat transfer out of Earth by convection if this lava has a density of and eventually cools to Assume that the specific heat of lava is the same as that of granite. 9: A person inhales and exhales 2.00 L of air, evaporating of water from the lungs and breathing passages with each breath. (a) How much heat transfer occurs due to evaporation in each breath? (b) What is the rate of heat transfer in watts if the person is breathing at a moderate rate of 18.0 breaths per minute? (c) If the inhaled air had a temperature of what is the rate of heat transfer for warming the air? (d) Discuss the total rate of heat transfer as it relates to typical metabolic rates. Will this breathing be a major form of heat transfer for this person? (b) If the temperature of the coffee remains constant and all of the heat transfer is removed by evaporation, how many grams per minute evaporate? Take the heat of vaporization to be 2340 kJ/kg. 1: Using a fan increases the flow of air: warm air near your body is replaced by cooler air from elsewhere. Convection increases the rate of heat transfer so that moving air “feels” cooler than still air. (d) The total rate of heat loss would be While sleeping, our body consumes 83 W of power, while sitting it consumes 120 to 210 W. Therefore, the total rate of heat loss from breathing will not be a major form of heat loss for this person. 14.6 Convection by OpenStax is licensed under a Creative Commons Attribution 4.0 International License, except where otherwise noted.